I am a trained archaeologist and mineralogist, working in the field of Archaeometry. My expertise lies in the application of stable metal isotopes on prehistoric smelting processes. After studying Pre- and Protohistoric archaeology in Tübingen, I recently obtained my master’s degree in Geosciences in Frankfurt. At the moment I investigate stable copper isotope fractionation during smelting of copper ores. 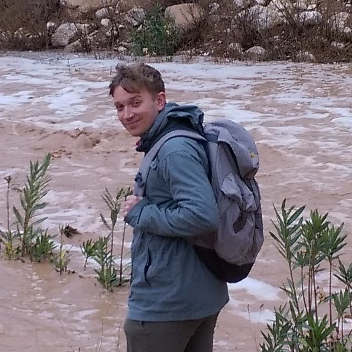 Michael Haas from Munich (Germany) is a young geo-risks researcher and treasurer of the German chapter of the YES network. Currently he is a PhD candidate at the Technical University Berlin and works as researcher for the Helmholtz Centre Potsdam German Research Centre for Geosciences (GFZ). He obtained a Bachelors in Geography from the Ludwig Maximilians University in Munich and a Masters in Geophysics jointly from the Ludwig Maximilians and the Technical University Munich. His master thesis was in collaboration with Munich Re and dealt with the development of seismic risk models for Central America. His current interests are mainly with georisks and focus on seismic risk. The PhD work deals with time and state dependent seismic risk on urban scales using multi-source imaging, machine learning and pattern recognition, stochastic modeling, seismic building fragility and risk modeling. Furthermore, he has a strong interest in the development of advanced web applications for numerous tasks entailed with disaster risk assessment and mitigation. Gamze Koc from Ankara (TR) is a member of German Young Earth Scientists (YES) Network since the very beginning and she is also Board Secretary of the German YES Network. Gamze was graduated from Hacettepe University Hydrogeology Engineering (B.Sc.) and she has a Master Degree (M.Sc.) about GIS-Based Erosion Modelling in Hacettepe University Institute of Science, Geological Engineering Department. Currently, Gamze is a PhD student at University of Potsdam Department of Earth and Environmental Sciences within a Marie Skłodowska-Curie Actions Research Fellowship Programme and she studies about rainfall-extreme events, flooding, erosion, and sediment-transport processes along the flanks of the Anatolian Plateau. Milena Latinović comes from Novi Sad (Serbia) and is the board member and deputy treasurer of German Yes chapter. Milena did her undergrad studies in Physics-Meteorology in her hometown Novi Sad. Further on, she completed her master degree in Geo-information Science and Earth Observation for Environmental Modelling and Management (GEM) at Lund University (Sweden) and University of Southampton (UK). Right now she is a PhD student at Free University in Berlin and research assistant at Potsdam German Research Centre for Geosciences (GFZ) where she is working on impact of rheological features in lithosphere and mantle on glacial isostatic adjustment and glacial dynamics, and its validation against sea-level indicators. I am a Geologist working at the Federal Institute for Geosciences and Natural Resources in the department of underground space for storage and economic use. From 2006 I studied geology at the Eberhard Karls University of Tübingen and completed in 2012 with a diploma (master degree) in applied geology. My current work focuses on the development of safety demonstration concepts for the storage of radioactive waste in deep geological formations of claystone or crystalline rock in Germany. I am the Executive Director of the Association of Polar Early Career Scientists (APECS), based at the Alfred Wegener Institute, Helmholtz Centre for Polar and Marine Research (AWI) in Potsdam Germany. I completed my PhD in Geography at the Justus Liebig University Giessen in 2011 and worked afterwards for two years as a post-doctoral researcher at the International Centre for Northern Governance and Development at the University of Saskatchewan in Canada. My research focused on projects in the Canadian Arctic and Sub-Arctic as well as Northern Scandinavia, addressing questions of comparative economic development, entrepreneurship, tourism, resource development and Northern engagement and participation in innovation and the knowledge economy. In October 2013, I assumed by current role as Executive Director of APECS, leading and managing the international office of the organisation first based at the UiT The Arctic University of Norway (Norway) and since February 2017 at the AWI in Potsdam. Among others, I am currently also coordinating the the APECS tasks in the four EU Horizon2020-funded projects APPLICATE, ARICE, INTERACT and Nunataryuk.